Insomnia Cookies employees reached a settlement with their employer after workers demanded higher wages, healthcare, and union recognition. 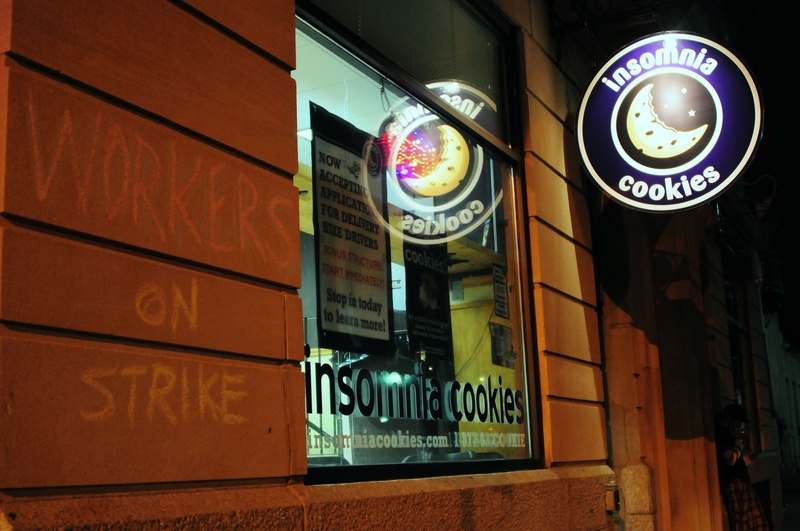 Former Insomnia Cookies employees who went on strike against the company last August after alleging unfair working conditions reached a settlement with the company Tuesday. The workers, who brought forth charges with the National Labor Relations Board, will be compensated with payback totaling more than $4,000 and will have their terminations rescinded from their records. In addition, the settlement requires Insomnia Cookies to hang a poster in their Harvard Square location stating the company is union-neutral and will not fire workers for union activity, according to an Industrial Workers of the World press release Wednesday. “Once we heard about the settlement, I was stoked because we actually made them pay up for what they owed us,” former Insomnia worker and striker Jonathan Peña said. Peña and three of his fellow workers, Chris Helali, Niko Stapczynski, and Luke Robinson, went on strike over working conditions at Insomnia Cookies, claiming they were being paid below minimum wage, were not allowed breaks, and were forced to work long hours. "I had something to lose, but I put it in my head that I didn’t really care because I was standing up for something,” Peña said. Management fired all four workers immediately after they went on strike. The workers subsequently joined the Industrial Workers of the World union, which helped them appeal to the National Labor Relations Board. Industrial Workers of the World also helped them start an advocacy campaign, which included pickets and boycotts to spread their cause to the broader community. “We found out from contacts inside the store that the campaign—between the picketing and boycotts—was definitely hurting their business,” said Industrial Workers of the World delegate Geoff Carens, who is also a Harvard library assistant. Harvard’s Student Labor Action Movement took to the cause by leading a petition for students to boycott the cookie company, which received hundreds of signatures. Students also teamed up with students from Boston University, Industrial Workers of the World, and the Insomnia Cookie strikers for pickets, marches, rallies, forums, and phone blitzes to generate enthusiasm for their cause. The collective effort by many in the Cambridge community contributed to the success in the settlement, Carens said. He credits much of the efforts to Harvard’s Student Labor Action Movement.